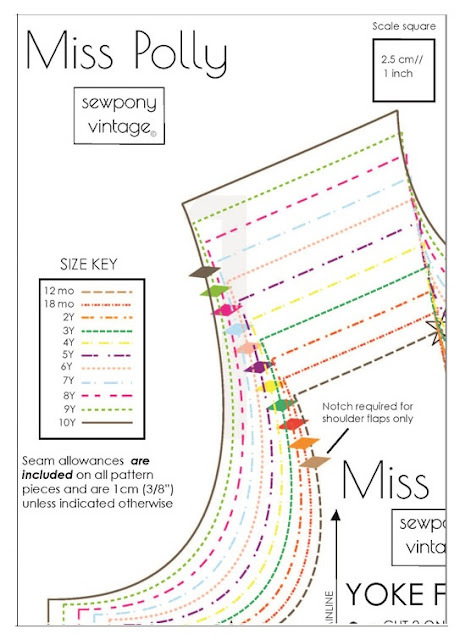 I am very excited to release the Miss Polly pattern today! I have had sixteen fabulous testers working hard over the past two weeks making up one, two and three dresses each! I have been very excited seeing all the photos coming in from these lovely ladies and am now excited to be able to have this pattern listed in my shop! Miss Polly is a sweet vintage inspired dress that offers three main views - sleeveless, capped sleeve and then either three quarter or long sleeves. A large apron pocket can be piped and fabrics can be mixed and matched to achieve different looks. Decorative shoulder flaps can be added to your dress too. The back closes with an invisible zipper and the bodice is lined. 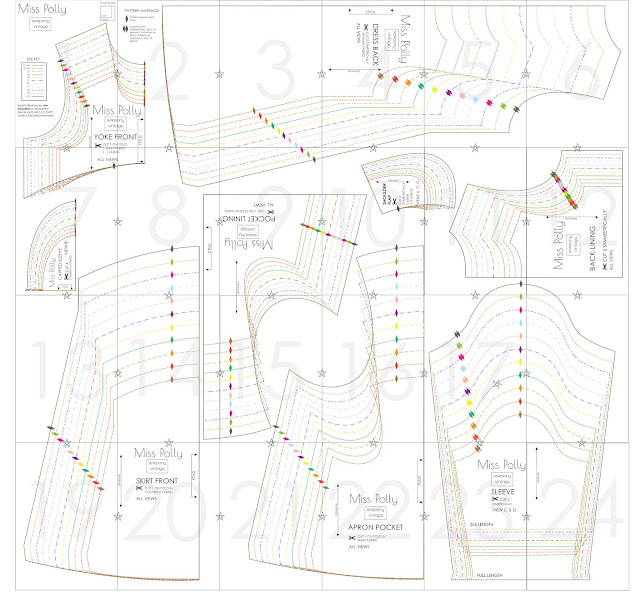 Below you will see some excerpts from the pattern file so that you know what to expect. The following woven fabrics are recommended for the main dress: quilting cotton, chambray, pinwale corduroy, velveteen, drill, duck, lightweight denim. For the front skirt (which appears through the apron pocket), use quilting weight cotton for best results. 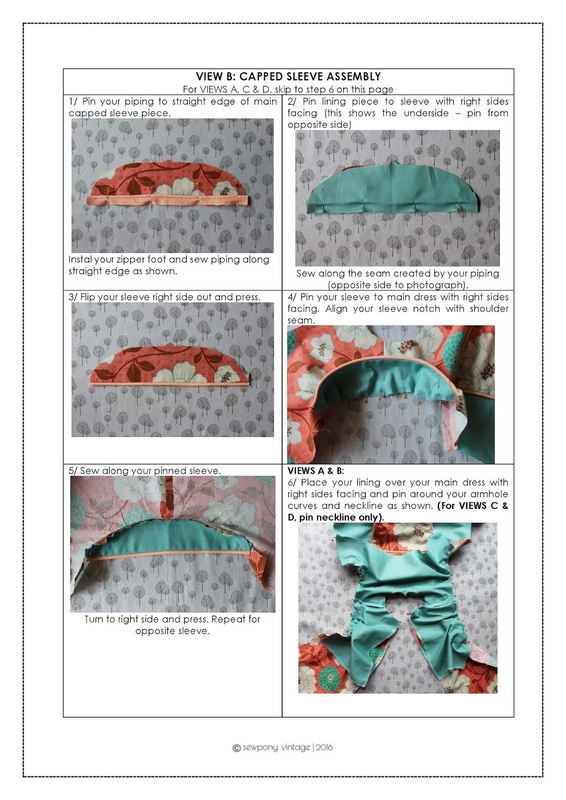 For the front and back bodice lining use quilting weight cotton, lawn or chambray. 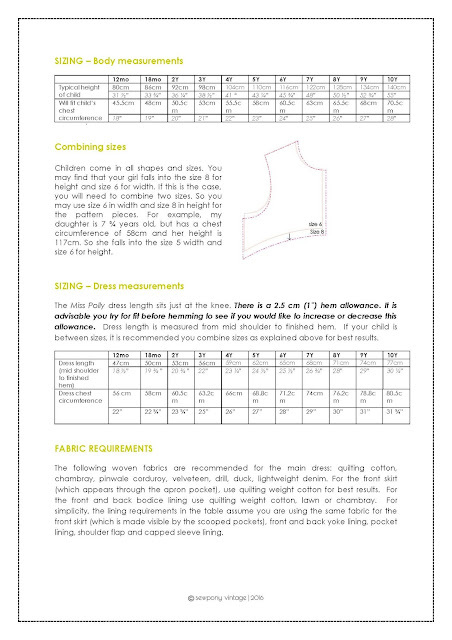 For simplicity, the lining requirements in the table assume you are using the same fabric for the front skirt (which is made visible by the scooped pockets), front and back yoke lining, pocket lining, shoulder flap and capped sleeve lining. VIEW C and D dress requirements are indicated with asterisks. If there are no asterisks, the requirements are the same. You can see a glimpse of some of the beautiful tester dresses below, but I will be writing another blog post this week where you can see all these dresses up close. Thank you so much to Renee, Thao, Jess, Nelleke, Miranda, Maarika, Emi, Brooke, Soso, Bettina, Aukje, Zoe, Anke, Annelies and Gaelle. You all did a spectacular job and helped me so much!! I am looking forward to sharing more of the dresses up close this week as they are just beautiful! 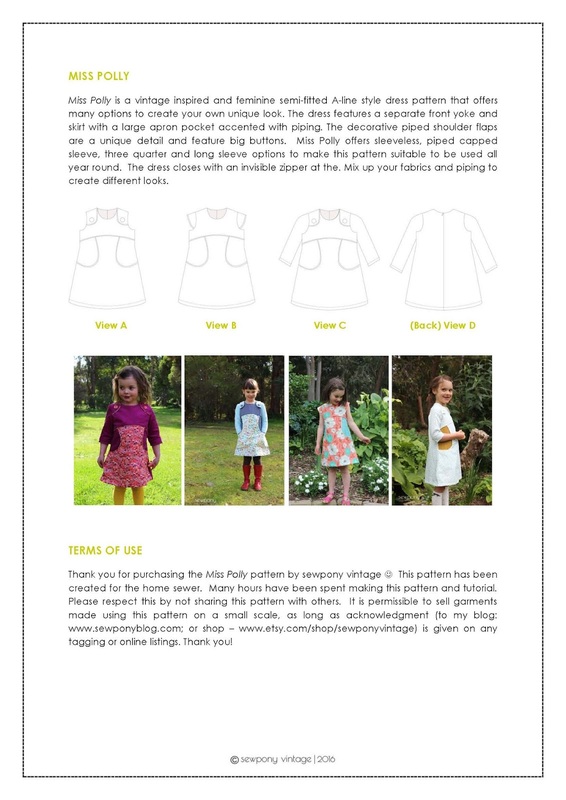 A big thank you also goes to Thao who let me use her beautiful dress on my pattern cover - thank you Thao! To buy your copy of Miss Polly, head over to sewponyvintage on etsy. 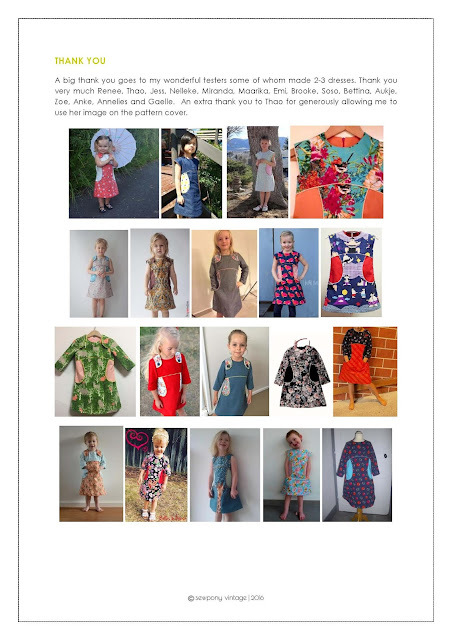 You can receive a 10% discount from now until Friday 9pm Melbourne time by using the code: MISSPOLLYDRESS10. Make sure to use #misspollydress on social media so you can share your creation! I'm sure i will make more Miss Polly's! Thanks for testing! This is such a sweet dress! We are in love with Miss Polly! Thank you so much for letting me test it! 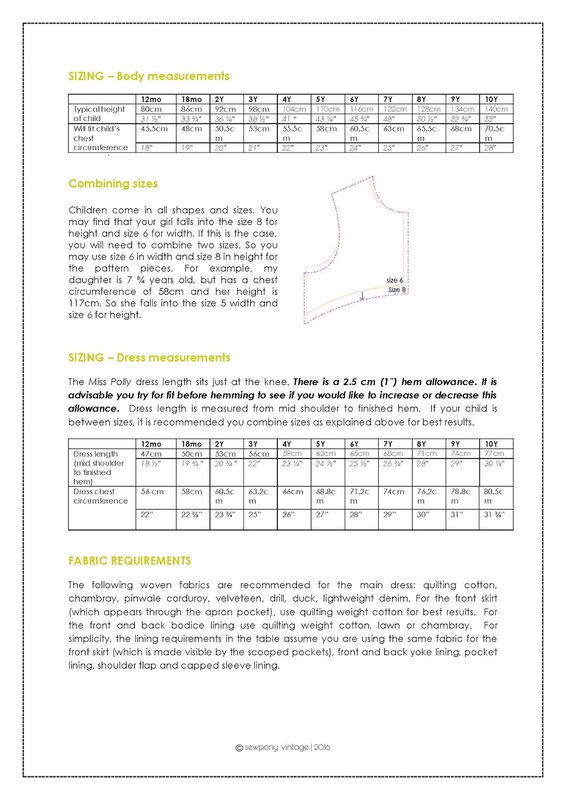 I didn't have the time to apply for testing, but I'm eager to sew one for my babysitting child soon! 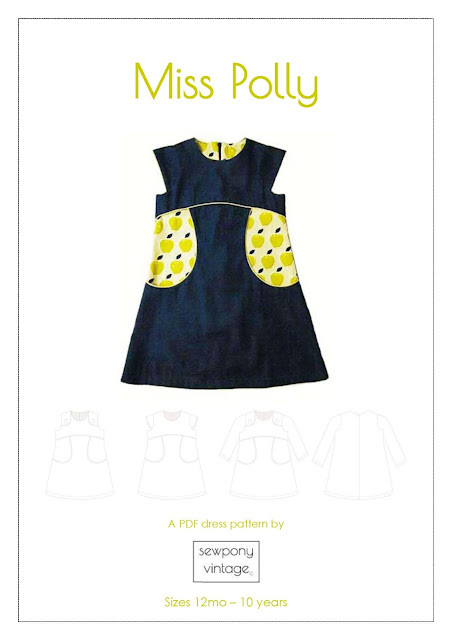 I'm looking forward to make the next Miss Polly for my own daugther! Thanks for letting me test the dress, Suzanne! j'ai bien envie d'essayer ce modèle que j'aime beaucoup , original comme j'aime ! This looks fabulous! I hope to get my credit card up and running again (we've had some problems with it...) and then I will definitely buy this pattern, and probably some others too, since I didn't really know them yet and discovered they're really very much the style I love! !